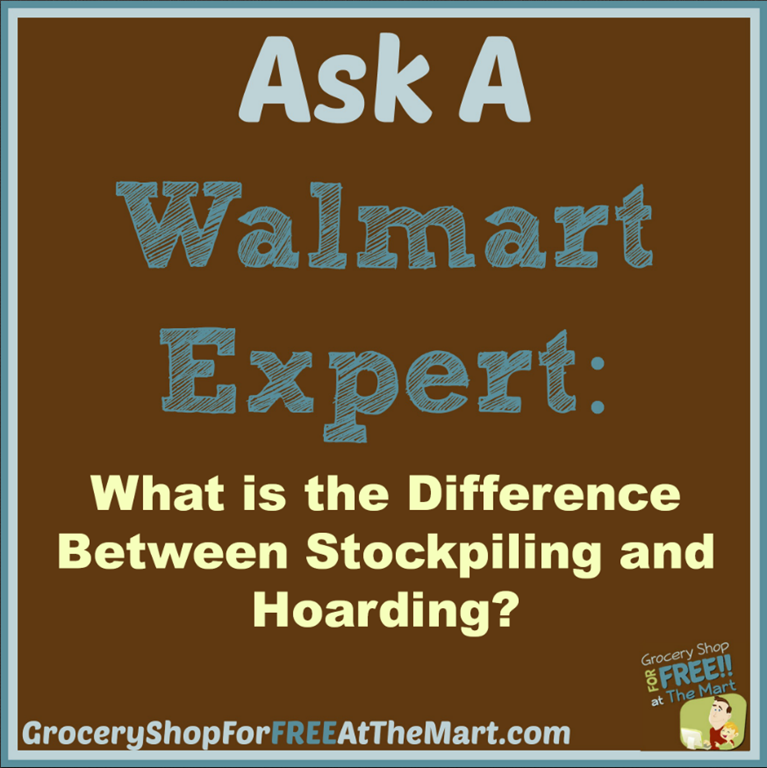 Ask a Walmart Expert: What is the Difference Between Stockpiling and Hoarding? What is the Difference Between Stockpiling and Hoarding? Well it happened. It’s happened before but it’s been a while so I may not of have handled it in the best way possible. I went on a little shopping trip this weekend; picked up some FREEbies, added a bit to my stockpile and someone decided that was hoarding. Before I get in to this post, let me just say that I was probably a little ruder to her than was called for. I had stayed up until 5AM getting my Reverse Coupon Matchups done and that wrong-headed comment was what greeted me straight out of bed. I hadn’t had my coffee yet and this poor woman bore the brunt of that but the fact remains, this was a dumb thing to say. Maybe not dumb but definitely ignorant. One of the best answers I ever heard to this question was from a blogger friend of my wife’s. She said simply “dust”. It was funny but it brings us to the big difference. This is key. Couponers are not generally stockpiling things we aren’t using. My little stockpile of Dawn is going to be used. We dirty dishes every day and they frequently need to be scrubbed. Now for the next few months I don’t have to worry about running to the store because I’m out of Dawn, I’ve got plenty. This is another important point, hoarders have an emotional attachment to their horde that compels them keep their horde. Stockpilers look to give out of their abundance. I have 2 adult sons and an adult daughter with 3 kids of her own. It’s not uncommon for them to come over and get toiletries like toothpaste, razors and deodorant from our pantry. I LOVE when they do that! If I can help them save money so they can spend it on other things, (like those adorable grandbabies ) I’m thrilled. It’s also not uncommon for stockpilers to adopt a homeless shelter or similar ministry and donate what they have a lot of. I bet Dian and I have donated thousands of razors alone to our local shelter. I’m sure there are other differences but these 2 are the big ones. Remember this if you ever see someone’s coupon shop and are tempted to suggest they are a hoarder. You don’t know what they are or what they will be doing with what they have. Give them the benefit of the doubt and assume they are stockpiling and not hoarding until you learn differently.